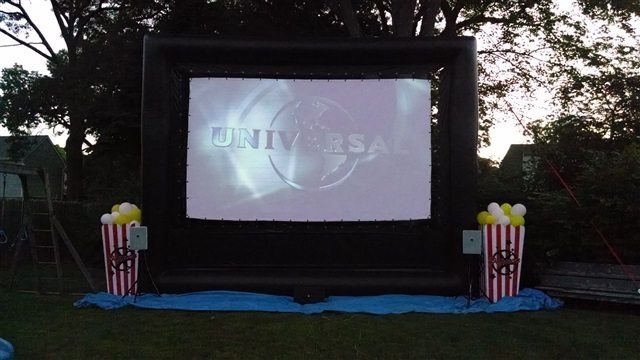 Bring the fun of the Drive-In Movie Theater to where you want with our Outdoor Movie Screen! 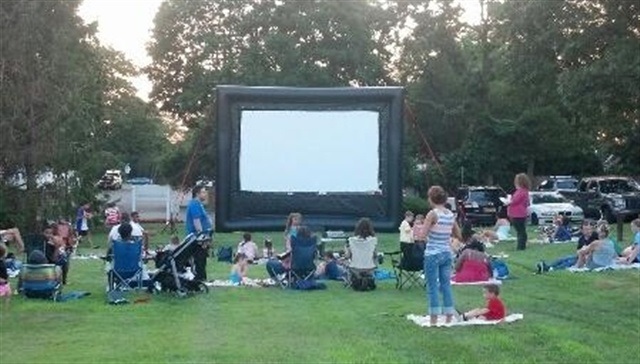 Watch your favorite movie in your backyard or anyplace you want on our Giant Inflatable Movie Screen! This giant screen measures 20 feet long and 16 feet high. That's 2 STORIES HIGH! This screen is inflated, not blown up with a blower constantly running during the movie. So there is no distracting noise during those quiet times in the movie. We offer it in 5.1 surround sound or 3.1 for larger audiences. This screen can also be set up for indoor events with a ceiling height of 18 feet. We recently added 2 - 1100 watt self powered, Concert Grade speakers for the left and right channels, 2 - 450 watt speakers for the center channel and 2 - 350 watt speakers in the rear. Now all you have to worry about are the neighbors! Included in the package is a bright digital projector, Bluray DVD player, Surround Sound Processor and speakers for a complete system. You also get 2 attendants to deliver, set-up and oversee all technical elements of your movie event. All you provide is the DVD and we take care of everything else. You get to sit back, relax and enjoy the show! You can add our Popcorn Machine or Giant Popcorn Boxes to your event for a party that will be talked about for a long time! **NEW** - FM Transmitter!!! Now you can re-create that Drive-In Movie Experience with our FM Transmitter. Your guests drive up in their cars, or they can bring along their own FM radio, tune in to our transmitter, and enjoy the movie! Perfect for car clubs or nostalgia themed parties. Add our Giant Popcorn props for more fun! How about you VIDEO GAMING FANS! We can project your video gaming system onto our giant screen for birthdays and tournaments. Add our Popcorn, Cotton Candy and/or our Table Top Hot dog Cart to complete your party! Want to see something even better? Wait till you see the kids sitting in your backyard holding a cotton candy Glo-Cone while they're watching the movie. Perfect for Sweet 16 Parties, Scary Movie Parties, Birthday Parties, Corporate Events, Civic Associations, Church, Camps, Car Clubs and anytime you want to offer that *Drive-In* movie experience! "The sound system blew us away!" "The picture quality is better than my flat screen at home"